A Pinch of Salt, A Dash of Sass.Chayote: Crisp Spring Salad - A Pinch of Salt, A Dash of Sass. Chayote is a fruit/vegetable native to Mexico, which is known around the world for its versatility, nutrition, and just plain deliciousness. It has about as many names as it has different recipes and ways to prepare it. I call it a Squash, but it is so much more than that! 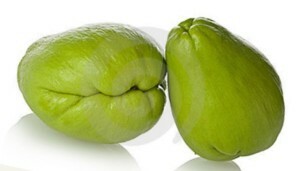 The chayote looks kind of like a pear with a pucker. They are the size of a pear, too, and should be firm like an apple. They are always green. It is more and more common to find them in mainstream supermarkets across the country. Since they are grown in warm climates, they are available year-round. I paid $0.80 for the one chayote fruit I used for this recipe. You will find a million different descriptions of the flavor and texture. I’ve seen it compared to a potato, a cucumber, a gourd (it is actually related to gourds), jicama, a pear, an apple, and a summer squash. It’s been described as flavorful or bland, crisp or tender, sweet, savory, great cooked, delicious raw … How can you go wrong with something that fits into so many categories? Here’s some weirdness: I think it tastes kind of like avocado, but the texture reminds me a lot of cucumber. Yes. Avocado. I think that’s why I like it with citrus as much as I do. A crispy avocado. Don’t just take my word for it, get yourself some chayote! Stir fry it, bake it, stuff it, grill it, or do what I did here and make a fresh, crisp, cool citrusy salad to welcome the warmer weather! Chayote "squash," also called pear squash, is a member of the gourd family. The crisp flesh is slightly sweet and reminiscent of a cucumber, and inspires this fresh, crunchy salad. Using a vegetable peeler, peel your chayote. Do this under cold running water, as peeling the squash sometimes produces a sticky residue that can irritate skin. Rinse well. Cut the chayote in half. In the center of the fruit there is a soft seed. The seed is edible but can also be easily scooped out with a spoon and discarded. Using a mandoline, V-slicer, or very sharp knife, thinly slice the chayote. Cut the fruit into matchsticks. Then chop the green onion and sweet bell pepper, and add all three to a bowl. Combine the orange juice, salt, pepper, and olive oil to make a simple dressing. Adjust seasoning to your taste, and pour over the chayote and other vegetables. Toss to coat, and refrigerate for at least one hour to allow flavors to meld. Serve and enjoy! Makes a great side dish, or even a slaw to use as a condiment. Works great with a spicy jalapeño pepper, or a vinegar-based dressing. Tweak it, make it your own! You really can't go wrong.